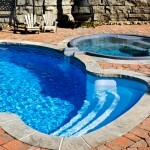 We’ll install patio pavers at your home in Mooresville with excellence from start to finish. Even during the late fall and winter months, the weather is quite pleasant in the Mooresville, North Carolina area. It’s nice to sit outside and take in the view while relaxing in your outdoor space. Without a functional patio, it’s tough to make the most of the agreeable weather, so give us a call at Lake Norman Signature Pools & Patios to make this dream a reality. Adding a patio is the perfect way to create a space to grill your favorite meals, kick back on comfortable chairs, and watch the sun set in the sky. Our team can expertly install patio pavers in your yard, providing a new place to enjoy time with your loved ones. We specialize in stunning paved and stamped concrete patios, which can transform your outdoor space with an upscale, custom look. Installing a patio at your property can also increase the value of your home while providing a safer place to walk around. When you have unfinished or raised sections in your yard, the risk of someone tripping is high. Before installing patio pavers in your outdoor living space, we’ll start by assessing the available space and planning the size and configuration of your new patio. This ensures that the paved section won’t overtake the rest of your yard, but is large enough to accommodate your needs. Our team will also ensure that the ground beneath the patio has been properly graded and compacted, providing a smooth and visually appealing surface. Contact us today to find out more about how patio pavers can transform your outdoor living space. We look forward to hearing from you!